I had a coach in college that constantly told the team, “You can do anything, if you have a plan.” I didn’t much like that motto at the time because the “planning” in that case was Cross Country training consisting of 50 miles of running per week mixed in with core, push-ups, and death by 1,000 Meter workouts. Today, I have a much better understanding and appreciation for planning and how it applies to all areas of life—one of those being the importance of planning in social media. Before you get the idea that there is a magic formula to planning out a business’ page’s social media, let me just tell you—there’s not. Be aware that too much planning may result in excessively rigid content. People want authenticity. That means you have to be intentional in planning ahead for “in the moment” content. This is especially true when it comes to documenting moments—for example, the snowstorm that came through in December of this past year (the most snow Mississippi had gotten in decades). 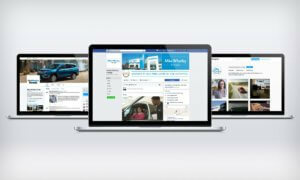 The Marketing Coordinator on the Visit Brookhaven MS account, Laura Hunt, moved around scheduled content to create a slideshow of gorgeous photos captured around Brookhaven. Laura still planned out which photos to include, how many, and planned what to write with the content before publishing the post. The point being—have a plan but remain flexible with that plan. Connect with your audience by making it personable. When I sit down with new clients, this is one of the first things I discuss in how we can improve their social platforms. This is easier said than done. It’s not always easy to capture a photo and sit down with someone for an interview simply because people are busy (especially in retail). That’s why it’s important to plan a time to get in contact with the employee, or sit down with someone in the industry, or set a time with a project manager to gather the right information and a quality photo to feature. 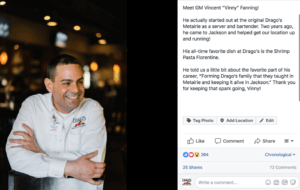 This post of GM, Vinny at Drago’s had a high viral reach because we planned a time to meet, took several different photos, and asked several different questions to create a post that would perform well organically. Vary your content. Varying your content keeps readers interested and engaged in your brand. One rule of variation in content is no more than 20% of social content on a monthly basis should be solely about a sale or service. By planning ahead, you can know if any one type of post is too prominent and adjust accordingly. Make it stick with graphics. 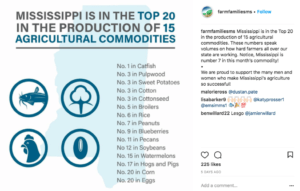 Mary Katherine has a passion for farmers, and it shows in the graphics she creates to engage and educate farmers in Mississippi as she manages the Farm Families of MS social accounts. Find information, rankings, or statistics that readers will find interesting and will interact with it. Finding time to throw together a graphic like this last minute would be difficult, but by planning ahead with a few key graphics, time is much better managed. There is a lot more to social planning than what meets the eye. However, given a routine and dedication, having a plan in place for your social media will pay off big time. Think of it like “Field of Dreams”—if you plan it, they will engage!